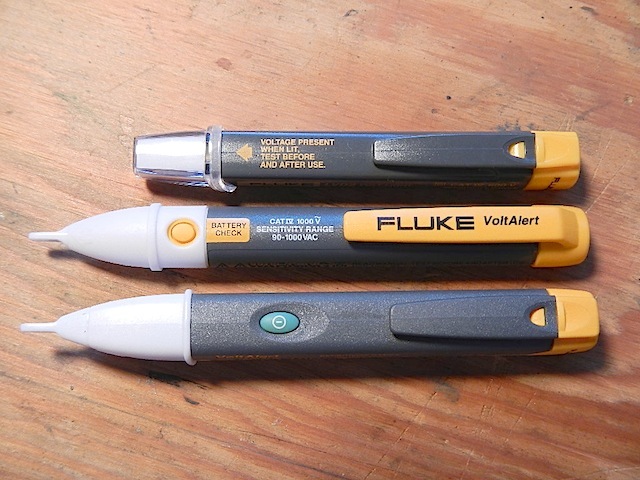 I have had the Fluke 1AC and 2AC non-contact voltage detectors for sometime now and love them both! 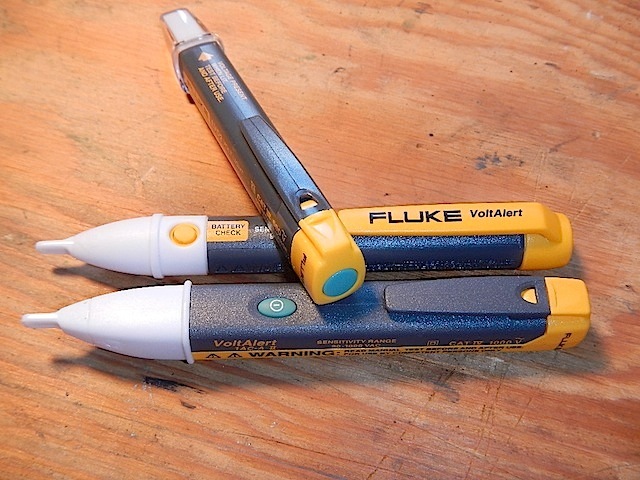 Been eyeing Flukes newest VoltAlert model, the LVD2 for sometime. One thing that kept me from ordering it was the fact that all the photos I seen of it online made it look the same size as the 1AC and 2AC models. For example look at the photo of all three side by side on Flukes own site. Is it just me or do all three look about the same size? Well today when I seen the LVD2 in person at Sears it was clearly smaller then either the 1AC or 2AC models, so I decided to pick one up. I have been keeping the 1AC and 2AC ones in my toolbox as IMHO they are just a little on the large size to carry in my shirt pocket. With the LVD2 having the LED flashlight on it along with it being smaller and less weight then the other ones I may just carry this one in my shirt pocket. Took a couple snap shots of all three of mine together so you can get a better idea of the difference in size. Anyone else have a non-contact voltage detector in there collection of tools? If so what model and how do you like it? A few things I use a non-contact voltage tester for on just about a daily bases. Make sure customer shut off the correct breaker to the dishwashers that are wired directly. Listen to beeper on non-contact voltage tester as I look for the correct breaker to turn off if they are not marked. Check each side of fuses for power. Check each side of dishwasher junction box for power in, power out. Could be bad connection inside junction box, such as burnt or loose wire nuts. Check for correct polarity at outlet, important for appliance with electronic control board. Check for power to dead garbage disposals to make sure wall switch is working. Check for power to refrigerator defrost elements. Check for power to gas stove bake/broil ignitors. Sure all the above can be done with a multimeter and a non-contact test will never replace a multimeter, but IMHO it's a bit simpler and faster when you can just lay the tester along side what your testing and be done. I use a ac sensor model 3115 and a field piece one in my Klien tool pack. 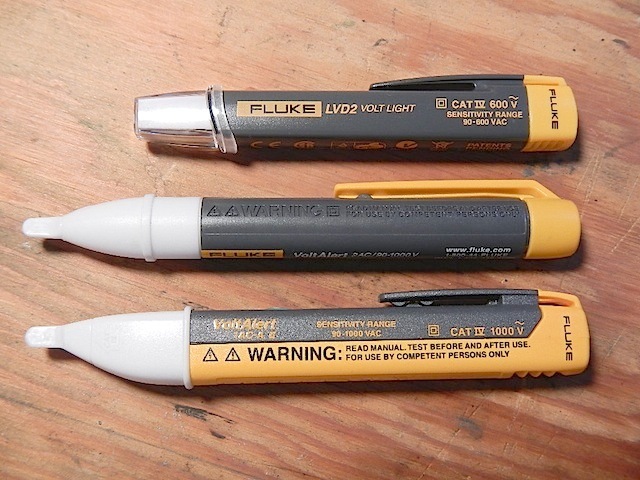 I should have listened to the reviews I read online about the Fluke LVD2. It's been a big disappointment trying to use the LVD2 to check for voltage. I have gone back to using my trusty Fluke 2AC as my new Fluke LVD2 seems to have a mind of it's own. Seems to work best when I hold my hand closest to the tip of it and it don't seem natural or the safest way to use it. I can not use the LVD2 to check the polarity of a 120 volt outlet as it simply lights if I hold it anywhere near the outlet. At times I can hold the LVD2 up to a spot on a wall that I know is not close to any power and the tester will light up if I hold it in about the middle of the tester. Really acts strange most of the time and it's nothing I would ever trust. Seems I maybe stuck with this piece of junk. Tried to return it at another sears store in a different town and they would not take it back because it was not in there system. Guess it not something that store stocks so its not in there system. The sears store I purchased it from the other weekend is a couple hours away. Just another reason to shop online. I hate to admit it, but I lost my fluke meter when I left it at a house. And it disappeared. So I replaced it with a Wavetek and have been happy, as far as my non contact, I have two I got from harbor freight. Along with my voltage clamp meter. Barely paid $7 for each. Work fine. not "professional grade" but at that price I could buy a new one every quarter if need be.